At one of New Zealand’s most varied Marine Reserves, Cathedral Cove is a joy to explore for people of all ages. If you enjoy paddling, you can do so along the sandy shores. Alternatively, those who love to get stuck into life beneath the waves can break out their diving gear and explore the nature rich habitats. This Marine Reserve features some incredibly delicate corals, but is still ideal for divers all abilities to visit. With over nine square kilometres of land for you to explore, this Marine Reserve is not one that you will exhaust easily. The habitats are incredibly rich, which is why the area was chosen to become a Marine Reserve in the first place. If you enjoy diving, there are multiple opportunities for you to meander between the rocks in hidden caves. Many of the sea life there is complex, including bright molluscs and crustaceans. Even if you do not enjoy venturing into the water, or if you are exploring with children, there is plenty to see in nearby rock pools. This includes spikey starfish, which are fun to photograph and draw. Snorkelling and rock pooling are particularly enjoyable at Cathedral Cove. Rock lobsters are quite common, and despite their long claws, they are friendly creatures. While lobsters are a delicacy in most areas of the world, do remember that you cannot take any away with you. The same goes for all forms of marine life at Cathedral Cove. The primary aim of conservation is to ensure that the habitat remains on touch, and it is your duty to help conservation efforts while there. Scuba diving is another excellent activity for those who love to observe marine life. However, as some of the descents can take you to around 300m below sea level, you need to time your ascent carefully. Doing this avoids the bends, and let’s face it, nobody wants to end their visit to a Marine Reserve with a medical emergency. If you would rather bring your boat to Cathedral Cove and spend time exploring the land, try the Cathedral Cove walk. While working your way around the walk, you may be left feeling as though you are in Hawaii, not New Zealand. If you do take your boat to Cathedral Cove, you need to observe some basic anchoring rules. Observe a five knot speed limit when within the boundaries, as well as when you are within 30m of other boats visiting the area. At the same time, you need to make sure you do not dump or discharge anything within the boundaries, as this can incur fines and criminal prosecutions. If you would like to stay close to Cathedral Cove, you can rent accommodation in Cook’s Beach, Whitianga, or Hahei. Unfortunately, you cannot stay on the Marine Reserve itself. However, all of these destinations are within easy enough reach for that to not be a problem. 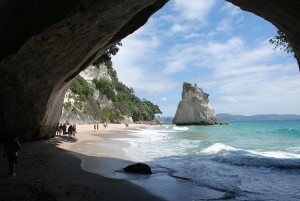 Cathedral Cove is an ideal Marine Reserve to visit if you are traveling with your family. The waters reach balmy temperatures during the summer, they are calm, and there are plenty of child-friendly activities. At the same time, it is a varied enough destination for visitors of all demographics to adore.